*This book was provided for me by NetGalley in exchange for a fair and honest review* So I have been in sort of a light-hearted romance mood lately. It's probably the snow, or that I have been feeling sick. This sure did do the trick though. Southern Spirits is the first in the Southern Ghost Hunter Mystery Series. 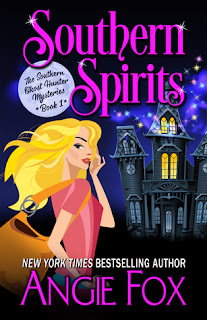 When out of work graphic designer Verity Long accidentally traps a ghost on her property, she’s saddled with more than a supernatural sidekick—she gains the ability to see spirits. It leads to an offer she can’t refuse from the town’s bad boy, the brother of her ex and the last man she should ever partner with. Ellis Wyatt is in possession of a stunning historic property haunted by some of Sugarland Tennessee’s finest former citizens. Only some of them are growing restless—and destructive. He hires Verity put an end to the disturbances. But soon Verity learns there’s more to the mysterious estate than floating specters, secret passageways, and hidden rooms. There’s a modern day mystery afoot, one that hinges on a decades-old murder. Verity isn't above questioning the living, or the dead. But can she discover the truth before the killer finds her? I really liked this book, and it didn't surprise me. Verity is very likable, due to certain events that happened to her before the start of the book you root for her since the very beginning. She's in a bad situation that just progressively seems to get worse. The first ghost you meet is Frankie, Verity accidentally dumps his ashes into her rose bush, trapping him to her house, she discovers however that some ashes are still in his urn so he can go wherever the urn goes. He and Verity soon form a alliance and with Frankie's help, Verity is able to see into the spirit world. Verity soon finds work helping get rid of a poltergeist for Ellis the Deputy Sheriff, things become complicated when she starts to feel attracted to Ellis. Ellis as it turns out is Verity's Ex-fiances brother. Secrets are soon revealed about the Poltergeist and Verity's life is soon on the line. There's a bit of mystery attached to the book that I have to admit I didn't predict. I really liked Fox's writing, she has a way of carrying the story so that you don't get bored. Fox also doesn't thrust the entire backstory at you in a way that makes it hard to digest. She incorporates it into the story really well. There are three other books in the series along with 2 short stories. I will be reading the next book The Skeleton in the closet. 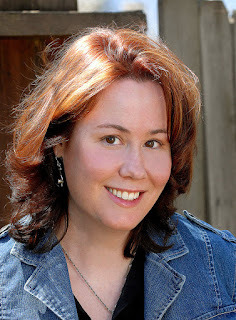 New York Times bestselling author Angie Fox writes sweet, fun, action-packed mysteries. Her characters are clever and fearless, but in real life, Angie is afraid of basements, bees, and going up stairs when it is dark behind her. Let’s face it. Angie wouldn’t last five minutes in one of her books. Angie is a graduate of the University of Missouri School of Journalism. She lives in St. Louis with her football-addicted husband, two kids, and Moxie the dog.